Although it was a family favorite for years, it was all but forgotten. Yeah, nobody has made this recipe for years. It’s funny because we made this recipe for years for family gatherings and everyone loved it. When I was planning on what I wanted to post this week, Mike mentioned that I should make something with beef. That’s when I thought of this recipe. I looked through my recipe box for the recipe and I could not find it. It’s like oh no, I couldn’t believe that I didn’t have it. But, I knew my sister would have it; she made this recipe more than anyone else in the family. When I called my sister Lauri for the recipe, she mentioned that she had not made the recipe for years. But she didn’t even have to look it up; she knew how to make it without looking up the recipe. It turns out that it is a simple recipe that doesn’t have a lot of ingredients. It turns out that my aunt had given the recipe to my mom many years ago. Now that I have the recipe I will not forget it. I am going to keep it on my radar. Of course, I had to change things in the recipe just a bit, but really there aren’t a lot of ingredients to this, so the changes were minimal. 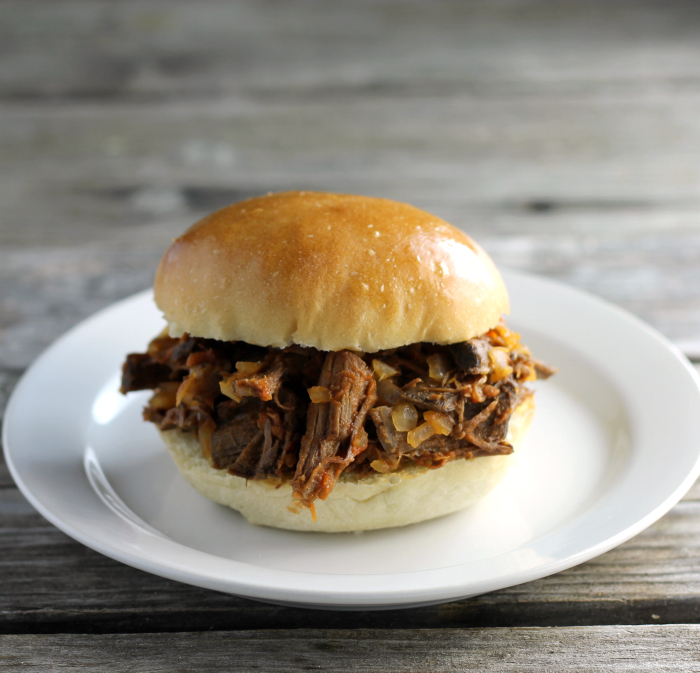 I put this in my slow cooker and it was a breeze to make. The beef is cooked in the slow cooker then shredded; after it is shredded you add bay leaf, canned tomatoes, lots of onion, and garlic. The beef is then cooked until the onions are tender. I served it on buns, the ones that I had on my last post. I am so happy that this recipe did not get forgotten forever, it’s too yummy to be forgotten. Add beef roast to slow cooker add water until the roast is just about covered, season with salt and pepper to taste. Cook on high for 4 to 6 hours or until beef is easy to shred. 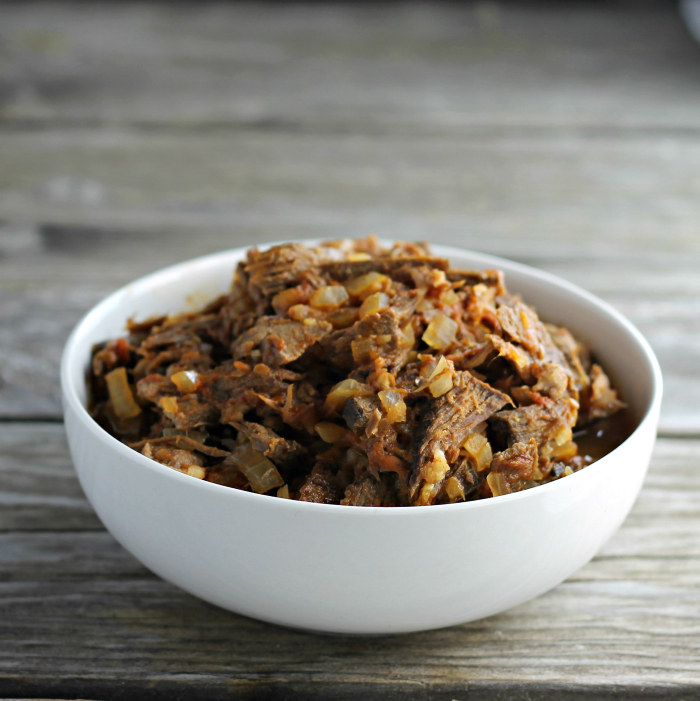 Remove beef from the slow cooker and shred the beef by cutting into thin slices and then shredding it with a fork. Remove the liquid that is in the slow cooker, it does not get used. Place it back in the slow cooker along with the bay leaves, brown sugar, chopped onion, minced garlic, and tomatoes. Season with additional salt and pepper if needed. Cook until onions are tender, about 2 to 3 hours on high. This can be made in the oven for a faster process. Dawn this look absolutely amazing!!! 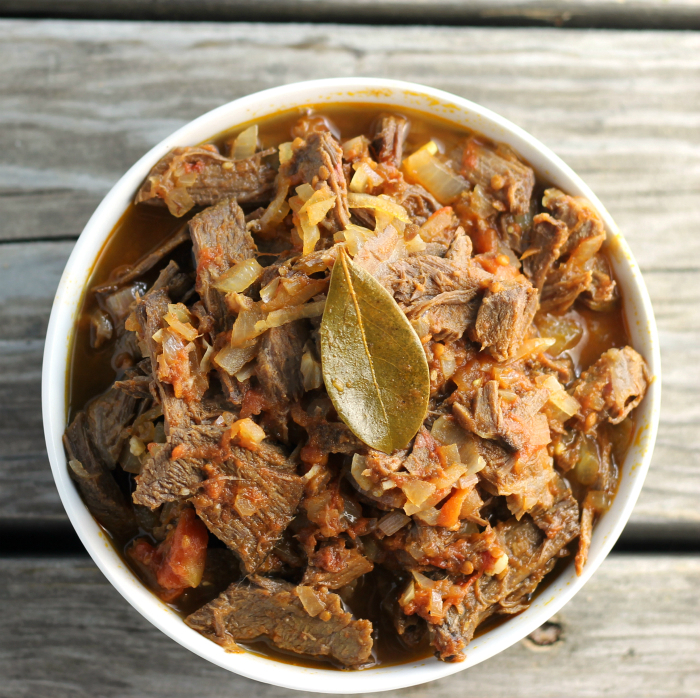 Slow cookers are definitely the best way to keep winter weather from ruining your day! I’ve seen so many slow-cooker recipes this month, made a couple myself, and I’m thinking about all the possibilities. There were lots of recipes that started with “shredded” or “pulled” or the like. Soups. Stews. Some with more spice, some with less. They all sound good. It seems that shredded pork has become the rage lately. 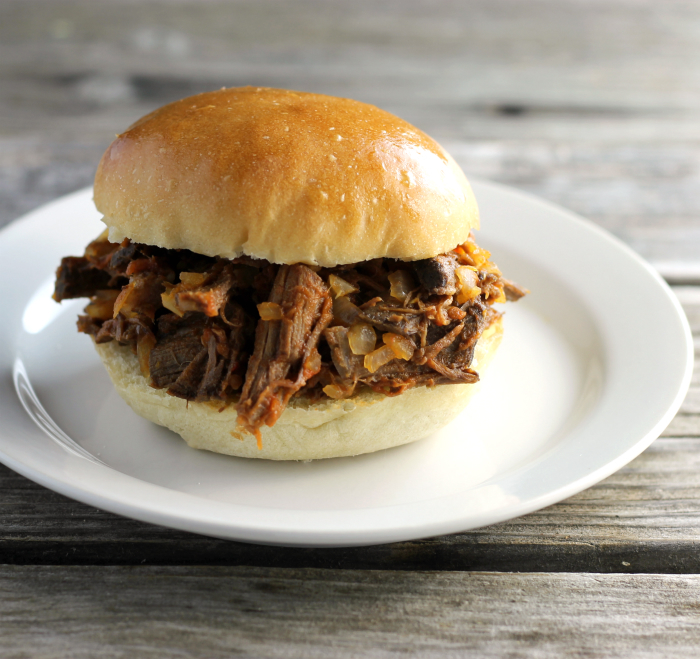 I’m glad you retrieved your beef recipe as it looks terrific in your sandwich. Hi Dawn, my husband would love this, will surprise him this week-end! I am making this right now and am wondering if I am supposed to pour out the water that the beef cooked in or reserve it and add everything else in with it. I am sorry, you remove the liquid that is in the slow cooker. No problem! That’s what I ended up doing. Delicious! I am so happy that you liked it. Thank you for trying one of my recipes!! Thanks, I’m glad you asked this question, I wondered that too. Not clear in instructions!